Sócrates Brasileiro Sampaio de Souza Vieira de Oliveira, Brazilian footballer and political agitator, died on December 4th, aged 57. One was short, fat and famously ugly; the other was handsome, slim and very tall indeed, with tumbling dark curls caught back in a headband. One skulked about in a grubby robe and sandals; the other shone in blue micro-shorts and the sun-yellow shirt of Brazil. One wandered round the market place, teasing out the Good with onslaughts of severely logical questions. The other played football; and that was pretty good, too. The fact that both men were called Socrates was not the only link between them. For the one born in Belém do Pará, at the humid mouth of the Amazon, was also an intellectual. In a sport in which most players’ brains soon take residence in their boots, he talked of Van Gogh and Cuban history, practised medicine and worried about democracy. Over a career that included almost 300 games for his main club, Corinthians of Seo Paulo, and 60 games for Brazil, he trod the pitch as a man of thought, reading the game like a mathematician before, almost nonchalantly, applying some genius touch. He meant what he said. He was never in a team that won the World Cup (though Brazil has done so five times); but then the relentless focus and discipline required to lift that trophy never pleased him. Like his namesake, he sought Beauty. And spectators found it whenever he played, with his elegant gazelle runs, his leaps and accelerations, his classy back-heels and his long, loping passes from midfield. There were few keener reminders of the Beautiful than the game against Italy in the 1982 World Cup, when he was captain: a game of surpassing skill and spontaneity capped by a wonderfully deceptive goal of his own, almost disguising the fact that Brazil then lost and left at the second-group stage. 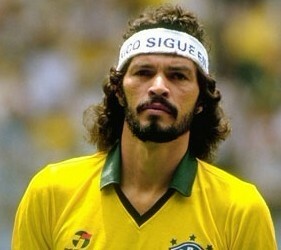 Yet Dr Sócrates, as Brazilian fans called him, never put football first in his life. Early on he would miss training sessions if they clashed with his medical studies. In a country that eats, breathes and lives football, where commerce stops for it and elections are planned by it, he insisted that the most vital thing was to get rid of poverty, build roads and schools and, not least, teach manners. His namesake would have called this pursuing the virtuous life. He called it “prioritising the human being”. The best thing about football, he said once, was the ordinary people he met—including those of Garforth, near Leeds in northern England, whose non-league team he coached for a chilly month in 2004. He disliked the way Brazil was run too, under a cohort of generals after a coup in 1964; he pestered for free elections by leading a Corinthians team with “Democracia” printed on their shirts, and by marching off in 1984-85, when Congress failed to pass the necessary laws, to play for Fiorentina in Italy. If this was subversion and “corrupting the youth”, he revelled in his dangerous influence. And he didn’t let up: Lula was good, he said, but earned a mere seven or so out of ten for how he had governed Brazil. For Sócrates only outright revolution, Fidel-style, rated a ten. Retired from football, he continued to campaign against the corruption rampant in the game. He demanded open elections—by players, fans, everyone—for the top job in the Brazilian Football Confederation, and toyed with fielding his team-mate Zico against the scandal-tangled president. He began to write a novel, set during Brazil’s hosting of the World Cup in 2014, in which public money was yet again disappearing into private pockets, and white-elephant stadiums were rising across the land. He saw no change in prospect. His own Corinthians, once struggling, were rolling in money, but he preferred his political slogans to the dozens of sponsors now blazoned on their shirts. And he would rather have seen a creative defeat than the ill-tempered game that made them national champions a few hours after his death. He died too young, after a dinner with friends which his weakened liver couldn’t take. But he always needed to set Brazil to rights over copious cachaeas at some café table: his own “Symposium”, where ideals would be pursued through smoke, alcohol and argument. As a doctor and ex-midfielder, he knew he should not have done it. As a philosopher, he sealed his death warrant with his usual wit and serenity.